Fort Loramie’s Evan Berning is swarmed by Anna’s Wyatt Bensman, left, and Riley Huelskamp during a Shelby County Athletic League game at Fort Loramie on Saturday. Anna’s Riley Huelskamp shoots as Fort Loramie’s Joel Cathcart defends during a Shelby County Athletic League game at Fort Loramie on Saturday. Anna’s Joel Cathcart drives past Fort Loramie’s Nick Brandewie during a Shelby County Athletic League game at Fort Loramie on Saturday. 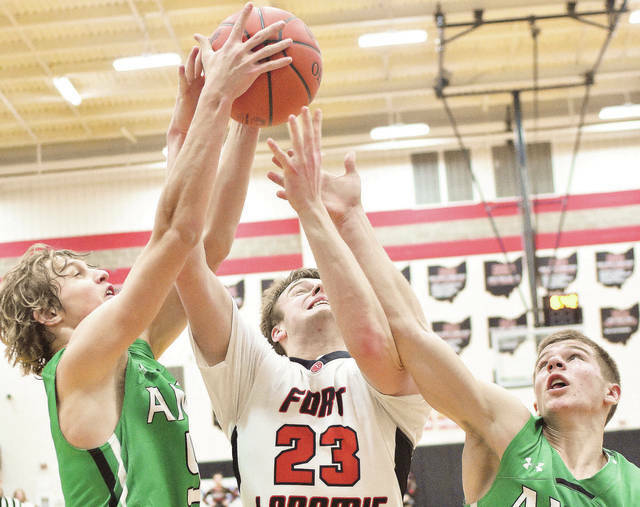 FORT LORAMIE — Anna’s depth has created problems for opponents all season — even the ones that have played and beat the Rockets. That depth caused problems for Fort Loramie in a four-point overtime loss on Jan. 24. And with one Fort Loramie starter playing while sick and another staying home with an illness, Anna’s depth was more bothersome on Saturday. Anna’s balanced offensive attack was as good as it has been all season in the Shelby County Athletic League game in front of a near-capacity crowd at Fort Loramie. The Rockets had five players score eight or more points as they pulled out to a big lead and fought off a late rally for a 59-55 win. The win keeps Anna in the SCAL title race. Russia (12-6) is in first place in the league with a 9-1 record, while Fort Loramie (19-2) and Anna (17-4) are tied for second at 9-2. Fort Loramie plays at Russia on Friday while Anna travels to Fairlawn. 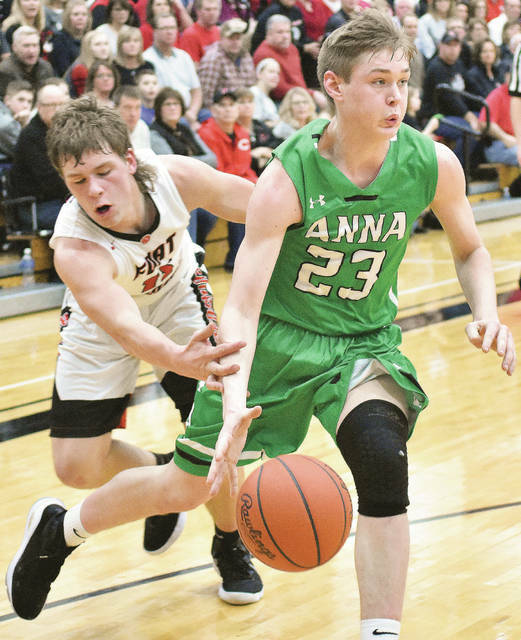 Russia lost at Fort Loramie on Jan. 5, while Anna lost both its league games against Russia. Anna’s four losses have come by eight total points. Sophomore Bart Bixler led Anna with 14 points, while senior Wyatt Bensman added 13 and sophomore Riley Huelskamp added 12. The trio of guards were aided in the post by senior Drew Brodman, who scored nine points. Senior Joel Cathcart added eight points. Fort Loramie’s players struggled shooting and holding onto the ball. The Rockets took advantage of several turnovers during runs in the second and third quarters, and the Redskins missed many open jumpers and inside shots at the same time. Saturday was senior night for Fort Loramie, and the team was without one big upperclassmen. Tyler Siegel, a 6-foot-7 forward, stayed at home with an illness. Senior guard Evan Berning was also ill but played. “I’ve got nothing to say on that,” Fort Loramie coach Corey Britton said of Siegel’s absence contributing to the loss. “It was just that we missed too many opportunities. Shoot, we probably missed seven or eight layups. We make those layups, it’s a different ball game. Anna led 26-24 at halftime. The Rockets increased their lead to 35-31 by the midpoint of the third quarter and then finished on a 7-2 run. Bixler started the run with a basket and Cathcart followed with a put-back with 1:39 left to give Anna a 39-33 lead. Huelskamp then made a basket and free throw to boost Anna’s lead 42-33. Fort Loramie senior guard Dillon Braun opened the fourth quarter with a 3-pointer from the left wing, but Bensman hit a 3 soon after and Huelskamp made a basket with 5:52 left to increase Anna’s lead to 47-36. The Rockets led 51-40 with 3:26 left, but Fort Loramie narrowed the final gap. Carter Mescher made a layup after a steal with 2:50 left and Braun followed with a basket with 2:04 left to cap off a 7-0 run. 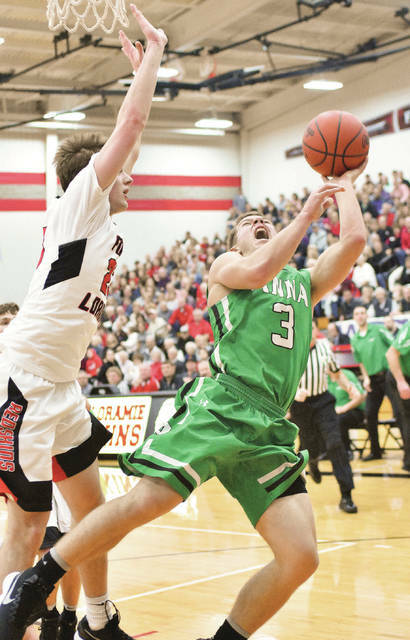 Bensman made a basket for Anna 10 seconds later to boost the lead to 53-47, and the Rockets led by at least five points until the final five seconds when Fort Loramie hit a pair of free throws to cut the final gap to four. Barhorst credited Bixler and Huelskamp for helping to create turnovers that sparked Anna’s runs. Fort Loramie led throughout the team’s first matchup in January before Anna rallied late to earn the overtime win. Bixler said Anna knew it would be a challenge to beat the Redskins on the road. The Rockets will close out a season of marked improvement at home against Fairlawn on Friday. Anna was 15-10 last year and hasn’t surpassed 15 regular season wins since a 22-3 campaign in 2010. The Rockets will likely be one of the top teams in the Dayton Division III sectional, along with Versailles (16-3) and Bethel (16-3). The tournament draw for all Ohio boys basketball teams is Sunday. Braun led Fort Loramie with 23 points while senior guard Austin Siegel scored eight. Britton said he doesn’t want the loss to detract from the success that Fort Loramie’s senior class has led. The Redskins have advanced to Div. IV district finals each of the last two seasons. Anna took an early 7-5 lead, but Fort Loramie went on an 8-0 run go up 13-7 with 1:01 left in the first quarter. Fort Loramie’s lead stayed at five points until Anna used a big run in the second quarter to take control. Bixler and Cathcart hit back-to-back baskets to bring Anna within 17-16, then Cathcart hit a 3-pointer from the left wing with 4:11 left to put Anna ahead 19-17. Fort Loramie took a 20-19 lead after a 3-pointer from Berning, but Anna responded with a 5-2 run to take a 24-22 lead. Austin Siegel made a pair of free throws to tie it, but Drew Brodman made two foul shots with 1:16 left to put the Rockets up by two. Fort Loramie ran off most of the rest of the clock and missed several shots in the last 10 seconds. Britton said Fort Loramie will look to bounce back on Friday against Russia. Contact Bryant Billing at (937) 538-4818, or follow @SidneyOHSports on Twitter and @BryantBillingSDN on Facebook. This entry was tagged Anna, Bart Bixler, boys basketball, Corey Britton, Dillon Braun, Drew Brodman, Evan Berning, Fort Loramie, high school, Joel Cathcart, Nate Barhorst, SCAL, SCL, Shelby County Athletic League, Tyler Siegel, Wyatt Bensman. Bookmark the permalink.